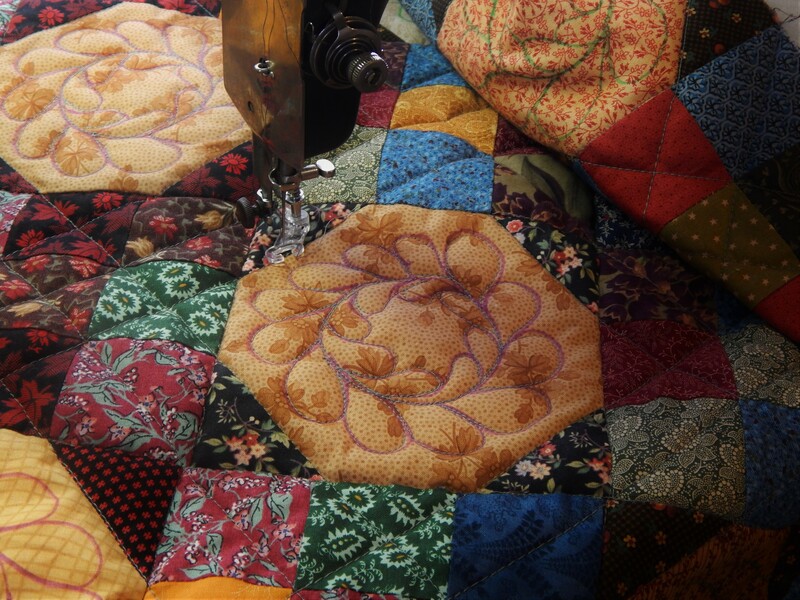 I have spent the day hand quilting the Luxury Essentials quilt. 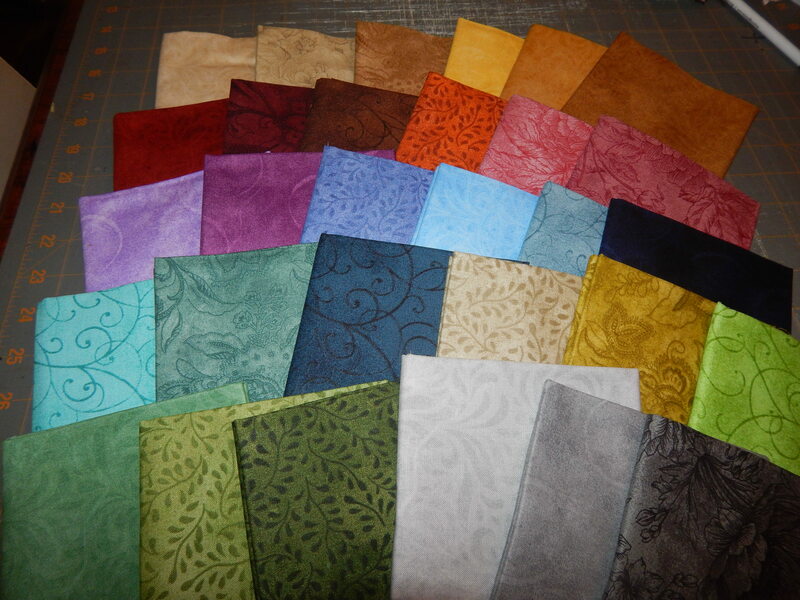 I have been thinking and thinking about what I will make with the Bella Suede bundle of fabric. 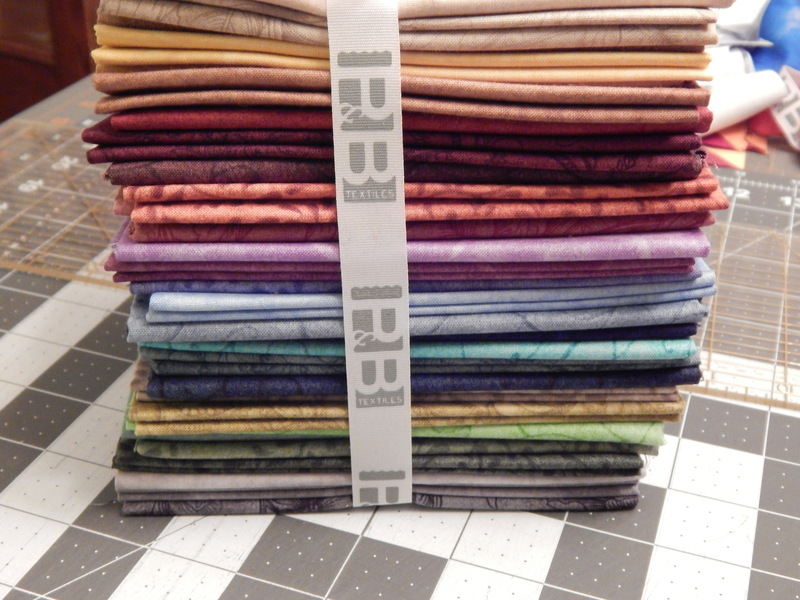 I have a few dozen Ideas of quilts that I think would be great with these fabrics so it will be hard to make up my mind. I suspect I won’t know for sure until I actually start. I really hardly ever start with a fully developed plan. I hope to have the current quilt finished in the next week or so, and getting close to the end of one always makes me get excited about the next one. I already have a dozen or more in progress but I can’t keep from thinking about more. So many ideas, so many dreams, so much fun! The Holiday Season gets a little hectic and we tend to get stressed and frantic but quilting is so calming and such a great stress relief. I hope you can take some time for yourself in the coming days to relax and quilt and think and dream. My soul is fed by needle and thread as the saying goes. Very few nights do I go to sleep ‘hungry’. Happy Quilting Tim! I believe you are wrong. Teddy is probably thinking the same, what will the next quilt be? Aren’t we going to start another one? What about all those fabrics this man has in storage with no intention to work on them? I must say he looks a little bit disappointed to me, maybe your quilting pace is not up to his expectations. Thank you for your good wishes, Tim, I really need some relaxing sewing time. Keep dreaming and telling us your dreams. I think he is in hopes that there will be another one for him…..he is really enjoying crawling under his and napping…. 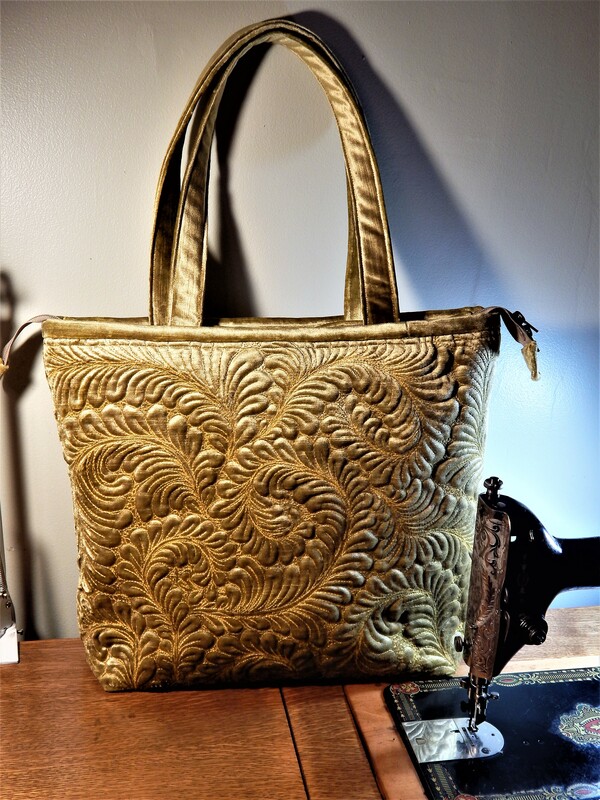 Love the new fabrics. Can’t wait to see what you come up with! 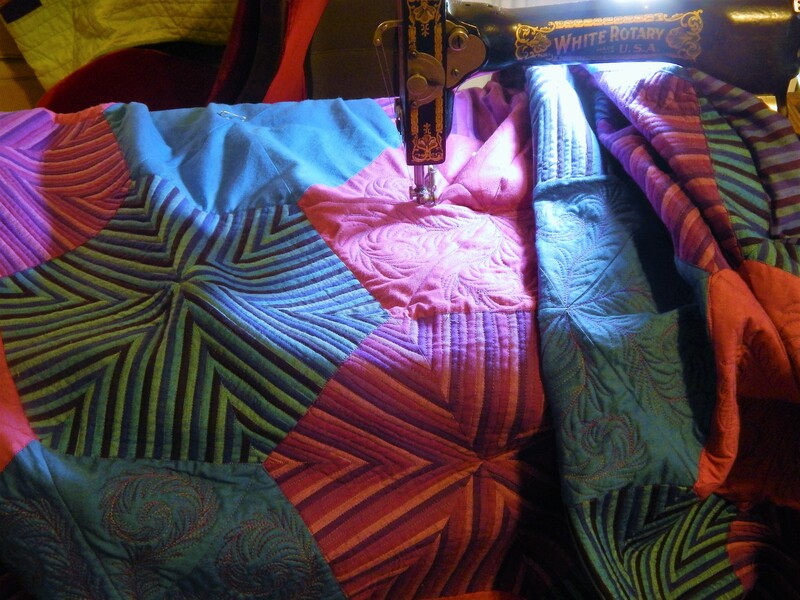 It is funny how quilting is self-inspiring. From one comes another. Teddy looks very thoughtful, and is probably wondering if the next one could possibly be as beautiful and cosy as this one…. 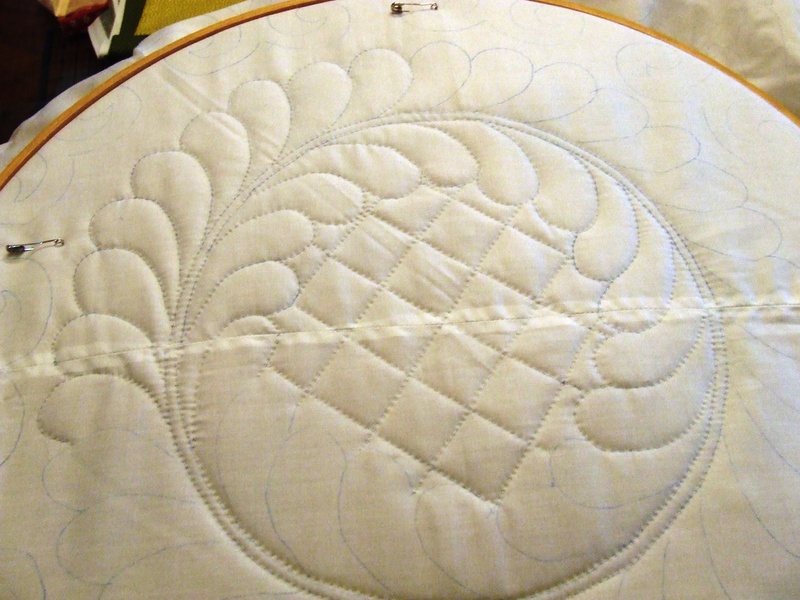 Thanks to you I am now enjoying quilting on my new Grace Hoop 18 inch frame. It is very relaxing! Happy quilting to you, Tim! This really is about your previous post-because I am slow…a quilting friend’s father said, “If a man riding by on horseback can’t see that the seam isn’t perfect, then it is okay.” That is a huge exaggeration, but it goes great with a sign I saw in a local quilt shop, “Finished is better than perfect”. I don’t have time to be perfect myself. I quilt well, and I get better with each quilt. However, I do not intend to be perfect. Not ever!!! 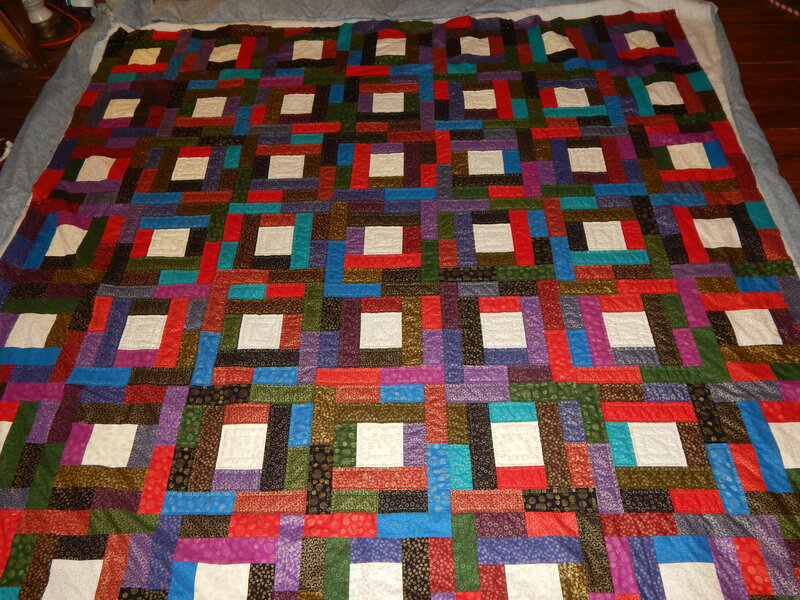 Beautiful quilts Tim! I see Teddy approves of them, too! Thanks for sharing so much of your work. I love your snowflakes, also!